There are two more boxes waiting to be reviewed but I thought that I should include a mid week nail post. After all this page is called Polish My Pretty Nails and not All The Beauty Boxes I Purchased! 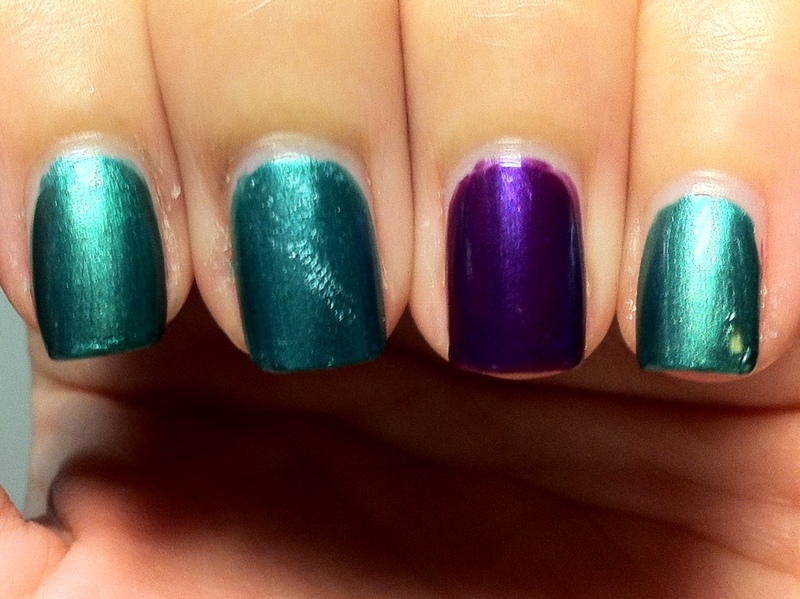 I have 3 nail polishes for you today. These beauties are from my WonderBox which I reviewed just a few days ago. It is my first time using these polishes so I did not know what to expect but I think I rather enjoyed them. Jacqueline Burchell is a Singapore based company (the reason why many of us have not heard of it) and boasts to have 1000 different shades of nail polish! I got 3 in my WonderBox – Amethyst, Galactic Evolution and Globular Cluster. The names sound so space-y and the colors are just the right shades to create a galaxy manicure don’t you think! First up is Amethyst. As it’s names states, is a rich metallic purple polish. Coverage is wonderful! I am actually only wearing one coat in these photos! Without top coat you can see that the polishes really brings out the bumps and dents on my nails. It dries to a semi matte finish too. But once I apply top coat you can see that the polish immediately changes! When glossy, the polish becomes a gorgeous jeweled toned purple! 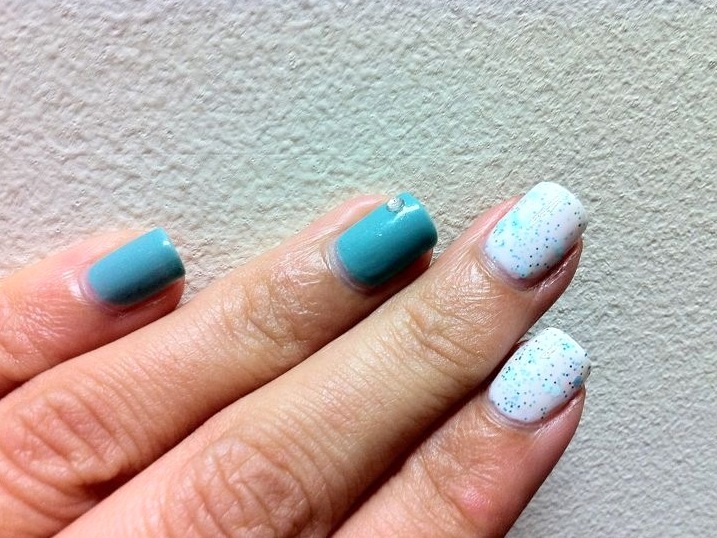 Next up is Galactic Evolution, a seafoam green polish. This polish wasn’t my favorite when I got the trio. But on the nail I have fallen in love with it! Aside from being really opaque (only 1 thin coat needed), it dries quite matte and actually hides the imperfections on my nails! With top coat the Galactic Evolution really shines! It now takes on a new look altogether! Hmm.. Galactic Evolution reminds me slightly of Seafoam by T.B.N. I will have to do a comparison to see how close they really are! And finally – Globular Cluster – the only one of the three polishes I received which is still available on Jacqueline Burchell’s online shop! Globular Cluster is a metallic taupe polish which dries a little grainy. This was my favorite polish at first sight but I was kinda disappointed with the finish. I have not tried any of the liquid sands polishes by OPI or the pixie dusts by Zoya but I high doubt it is anything like this polish! If this was to be a textured polish I would say that there isn’t enough gritty bits to pull it off. If it is a regular polish then I would imagine that I got a bad batch which just wasn’t shaken up enough. I tried to hide the texture with top coat but it didn’t really work out. Maybe I just needed a lot more top coat? But honestly, aside from the grittiness, I still do like this color! I am after all a fan of neutrals. 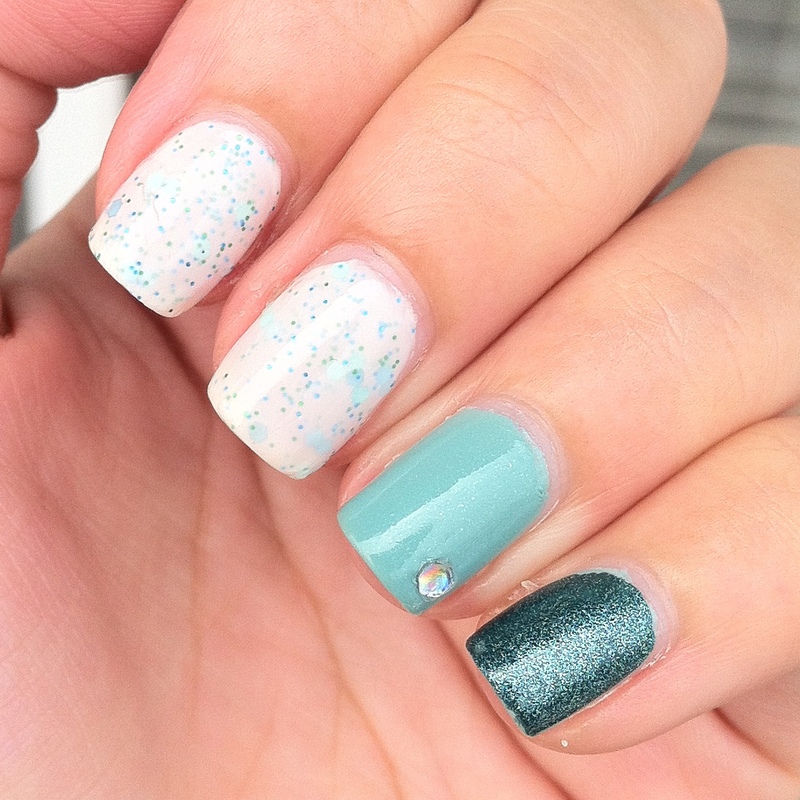 I was actually surprised by these polishes! Never would I have thought that they were all good to go in one coat. Defnitely a +1 for opacity! I have 1 qualm though. These polishes smell really different from normail nail polishes. The usual nail polish-y chemical smell wasn’t there. But in place of it a strong paint smell. Not paint like the ones you use on your walls, but art paint. Poster colors to be exact! The smell doesn’t really bother me so I do not see that I would keep them hidden in my drawer for too long. I seldom wear bold colors together. I usually use bold colors as accent nails or pair them with a glitters of the same color or maybe black or white to tone it down a tad. I don’t want my manicures to stand out too much in the work place. But since it’s the holiday season (Chinese/Luanr New Year) I thought this would be the perfect opportunity to bust out some brights! 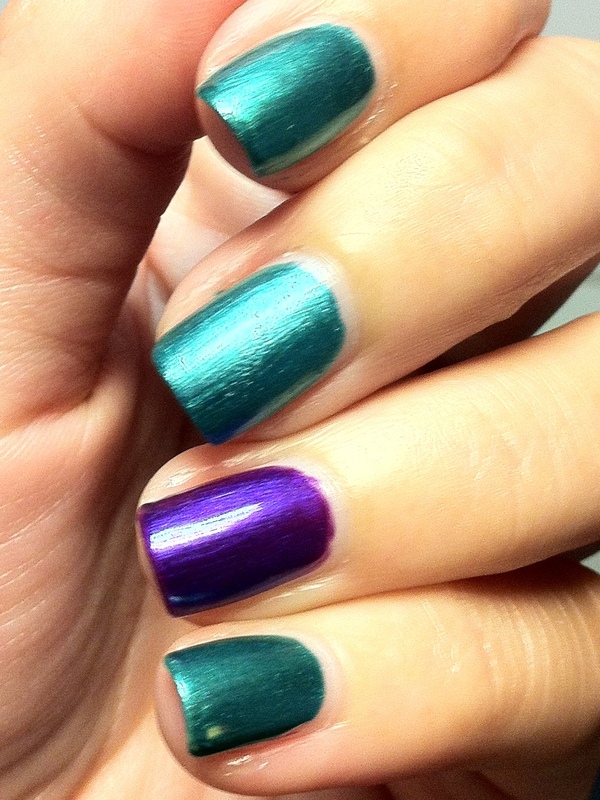 But dents and smudges aside, I think the pairing of these 2 polishes look really good. 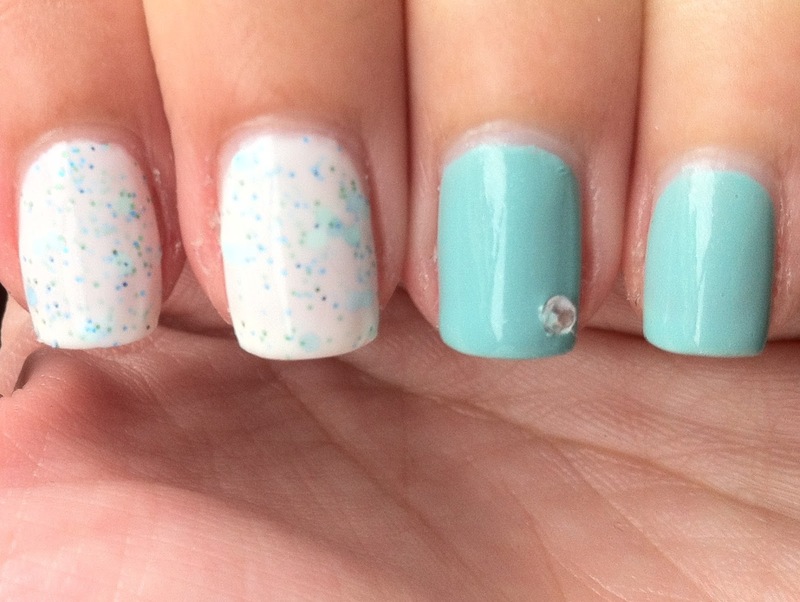 And my nail art over these? I think it’s pretty cool as well! Come on by and check it out tomorrow. So yesterday I popped by Sephora just to have a look-see and found this nice dark teal polish from the Sephora mini nail polish rack. It was a very rich vampy color and went with my nails very well that day. I held on to it for a minute of two and even put it in my basket. But alas, at RM21 for a small bottle I just couldn’t bring myself to buy it. Though I did not buy it, I had a go at it and I am impressed! The polish although a little on the thick side, covered nicely in just one coat. The brush on the bottle was also really easy to use. All I did was swipe the polish on in one stroke on my pinky and the whole nail was covered. I am curious why these Sephora polishes aren’t that popular in the nail blogging community. I wouldn’t mind picking up a few only if it’s on sale. RM21 (~USD7) is just too far from my budget for a mini bottle of polish. I really really love my last order from Llarowe. Another lemming down! Wahoo! Glass Elevator by Smitten Polish has been on my radar since the day it launched. 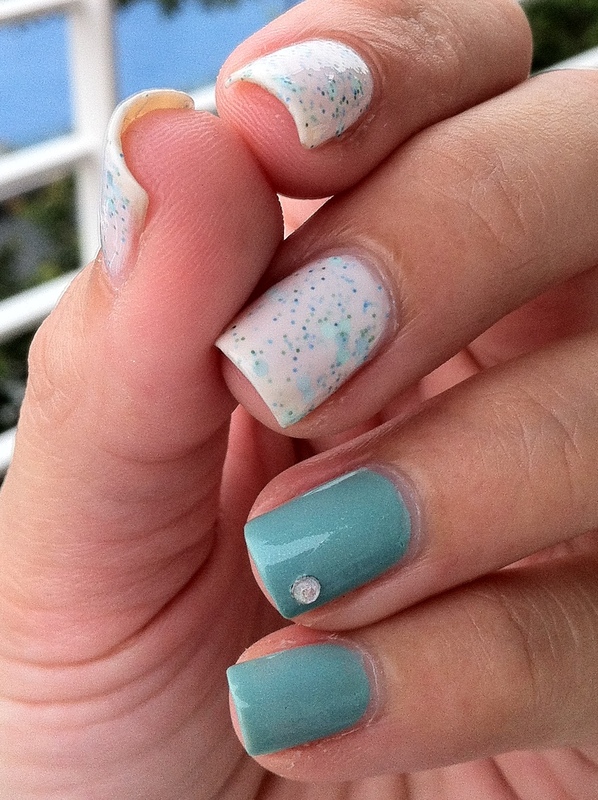 It is packed with different sizes of matte teal and light blue glitters suspended in a white very pale aqua milky base. 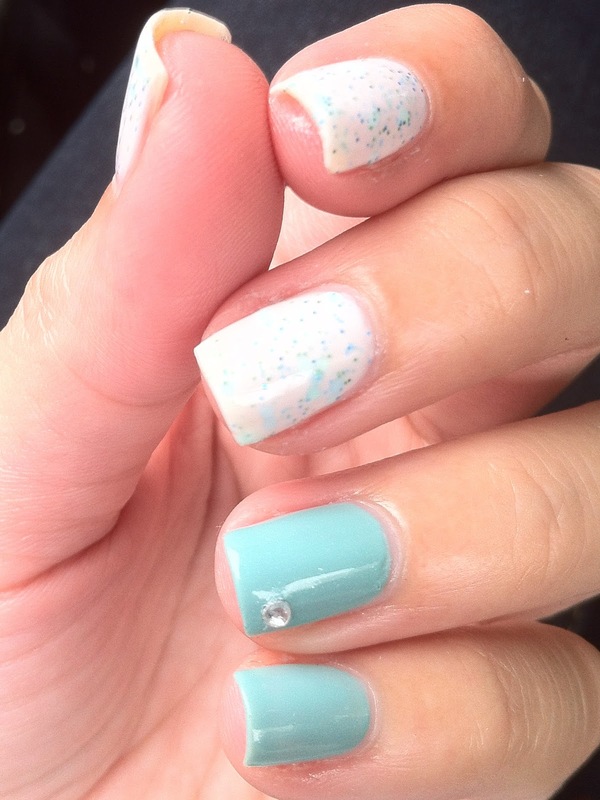 I wanted to bring out the teals and blues in this polish so I paired it up with a nice light blue – Cult Nails Manipulative. And to top it off and create a skittlette manicure, I stuck a little gem I got from the Cult Nails goody bag on my ring finger. It it said to be a dupe for Dollish Polish’s Expecto Patronum and Pretty and Polished Wherever you go, I Virgo. Anyone has those or have done a comparison of them? Winter is almost here! It’s time for me to bust out those metallics and cool winter hues! Today I have Face of Australia’s Let’s Go Scuba Diving for you. The name is soo not winter friendly but the color sure is! It’s a nice metallic turquoise color with very subtle silver shimmer in it. I am not too sure but this sure looks a lot like essence Choose Me! Probably a tad lighter and not as foil-like. I find that this color really complements my skin tone. It makes my hand look much fairer too! As many of you know, October is the month for Breast Cancer Awareness and Depression Awareness represented by the pink and green ribbon respectively. With this in mind I created this mani collaborating these colors to show that I do care for these two causes. I am no expert so I shall not bombared you with my ramblings. But if you want to know more on these two illnesses, I would suggest heading on to the breastcancer.org and (since I couldn’t find any official websites for depression awareness) Scrangie’s very well written post on depression for more details. This is my first attempt at a more complicated tape mani. I used this video from Sophie of My Awesome Beauty as my guide and I think the final result came out quite well! And for my right hand I decided to switch it up and do a pink version! Colors I used are Skin Food Pedicure Sparkle in Silver, OPI Alpine Snow, Nature Republic Baby Pink, Baviphat Light Pink, OPI Lucky Lucky Lavender and OPI That’s Hot Pink. I kinda ‘cheated’ on the right hand. As you can see it looks quite simple compared to the left hand. The most sections per finger is only 4 as opposed to 5 on the left hand. Who knew one finger could make such a difference! One more shot of my left hand. If you have been here long enough, you would know that I used piCture pOlish peacock once before in a tape mani and it did not turn out as good as I thought it would. The colors just did not go together. So, this post is dedicated fully to peacock! peacock is a deep purple jelly based with many different shapes of emerald and blue glitter. This time I chose to present peacock all on it’s own, 3 thin coats and no undies whatsoever. On it’s own, peacock has very good coverage for a jelly polish. The base color is dark and no VNL is obvious after 3 thin coats. The thing that bothered me most is that the base color is a little too dark for my liking. Under certain lighting, it looks black than the rich purple that it is. This photo below represents the polish the best IMO! you can see the glitter in full force and the base is an obvious rich purple color! I took some photos with flash too! These photos really bring out the purple in the base color! And last but not least, a blurry photo to show off the glittery goodness of this polish! peacock and other piCture pOlish nail polishes can be bought from their website and this list of international stockist on their website. I got mine directly from the girls but I did get one or two of my piCture pOlishes from Llarowe. Do follow the girls on Facebook and Twitter for updates and giveaways!